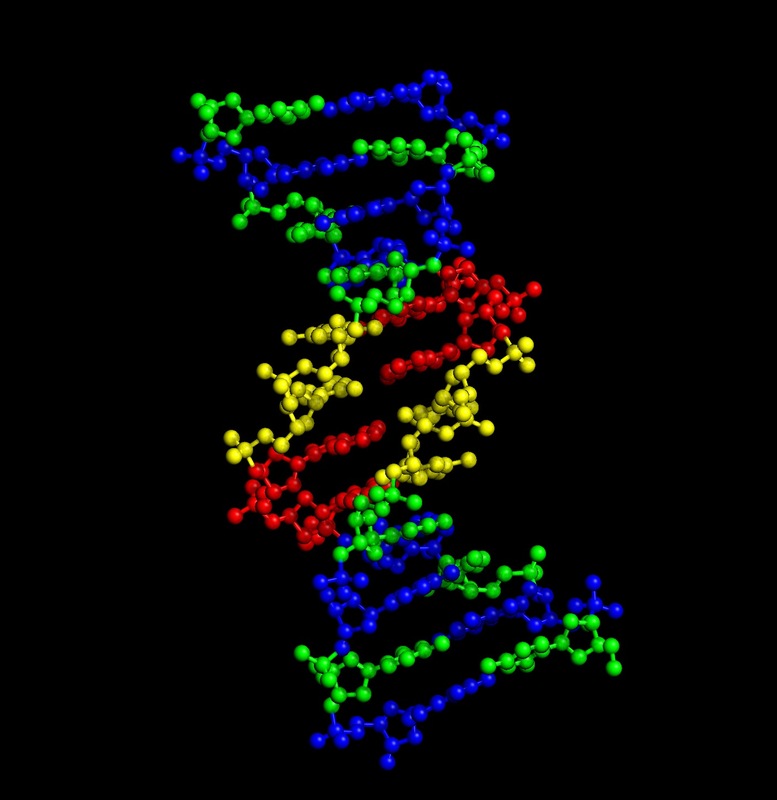 Today (4/25) is national DNA day. 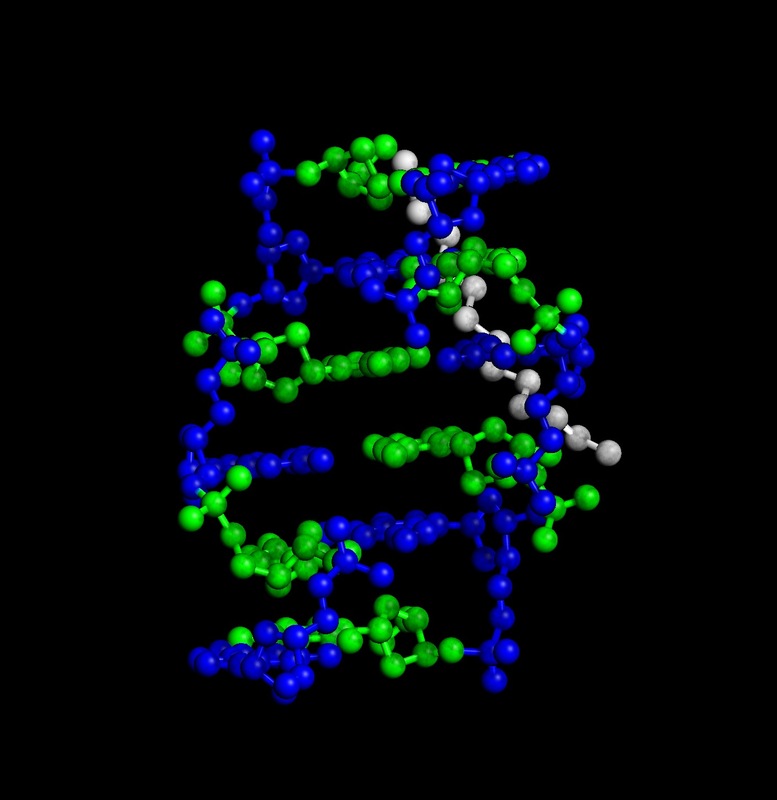 Digital World Biology™ is celebrating by sharing some of our favorite structures of DNA. 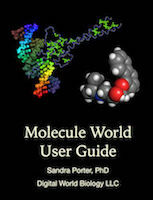 We created these photos with Molecule World™ a new iPad app for viewing molecular structures. As we are taught in school, the double stranded DNA molecule is a right-handed helix as determined by Watson and Crick using Franklin's x-ray diffraction images . 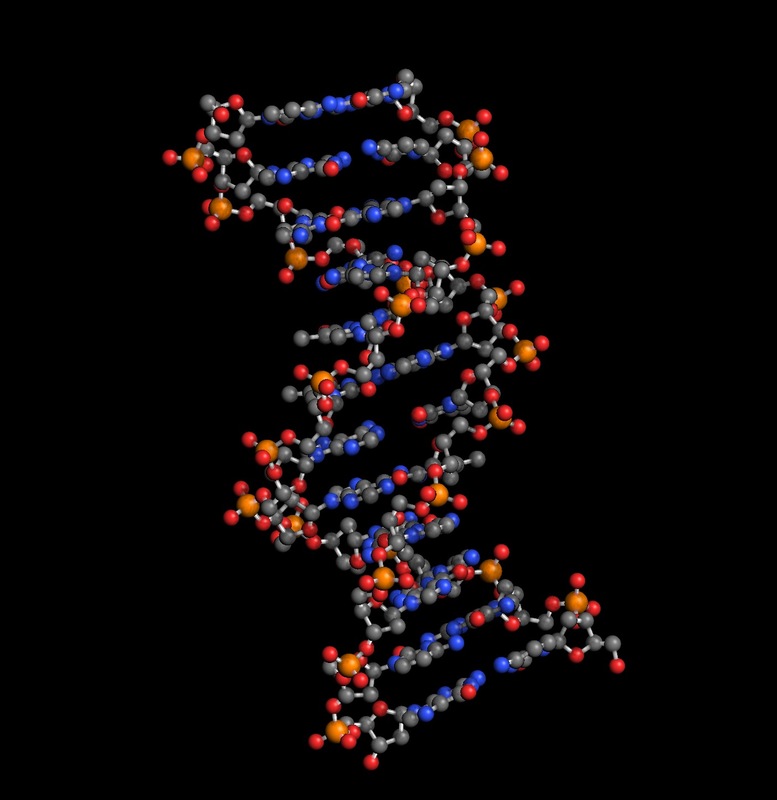 This B-form of DNA has approximately 10 nucleotides per turn of the helix and is the most common form of DNA found in nature. Classic structure with the elements colored. Classic structure with the bases colored. Classic structure with the strands colored. 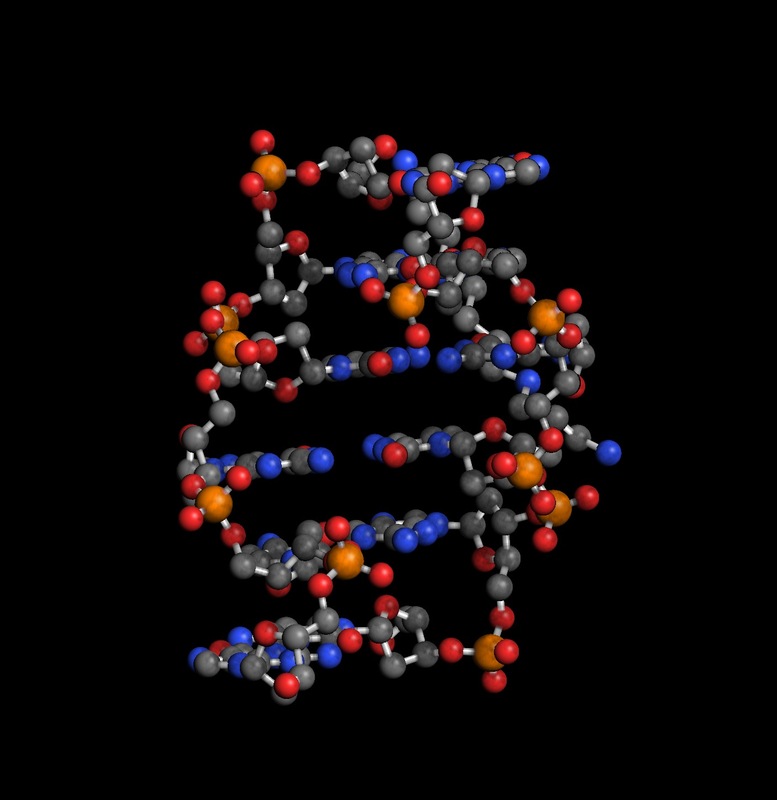 However, we've heard it said that the first crystal structure of DNA was not right-handed (pers. communication S. Elgin, Washington University). Instead, the high salt and GC base-pairs, used to form the DNA crystals caused the helix to twist in a left-handed way, creating a structure called Z-DNA. Z-DNA occurs in nature, but is most frequently used by marketing departments to [incorrectly] create company logos. Z-DNA with the elements colored. Z-DNA with the bases colored. Z-DNA with the stands colored. In addition to B- and Z-DNA, DNA can exist in another form known as A-DNA. A-DNA occurs when DNA is dehydrated, but also in DNA/RNA hybrids and double stranded RNA. A-DNA with the elements colored. A-DNA with the bases colored. 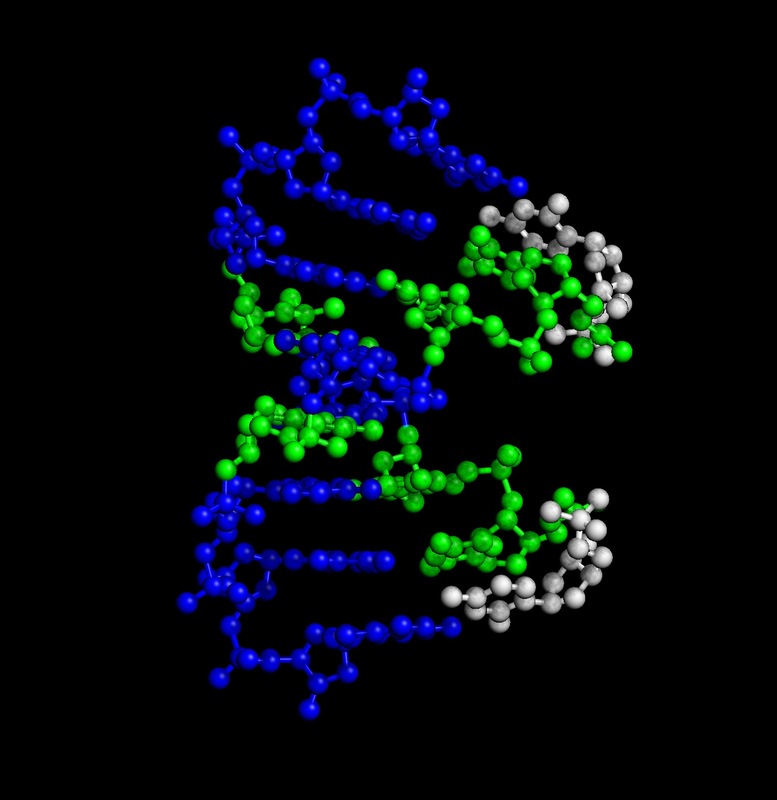 A-DNA with the strands colored. Here's another look at the same molecules, this time head on with the structures rendered in tubes and the bases colored. 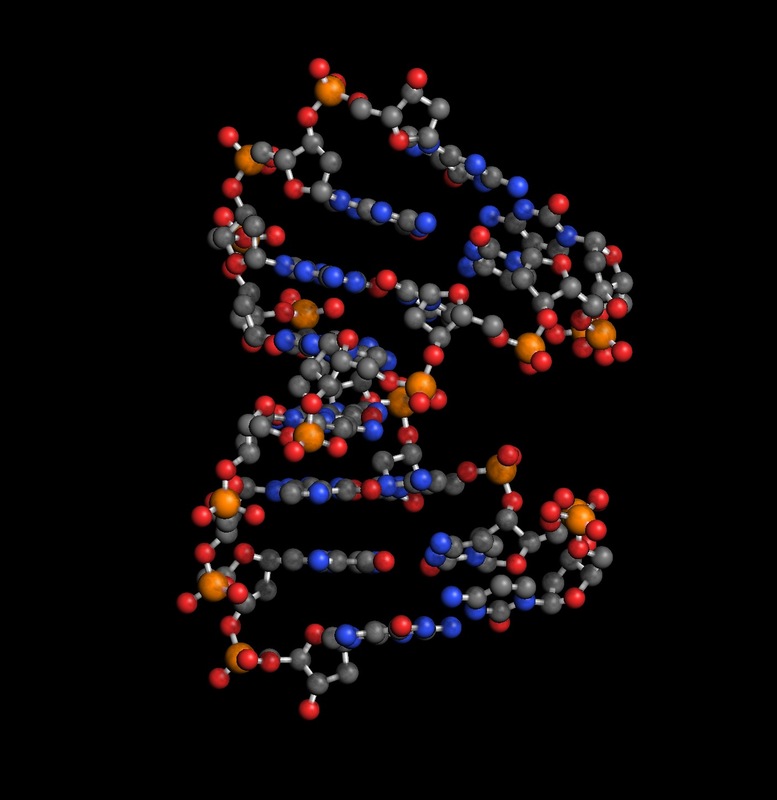 B-DNA "on end," showing the double helix. 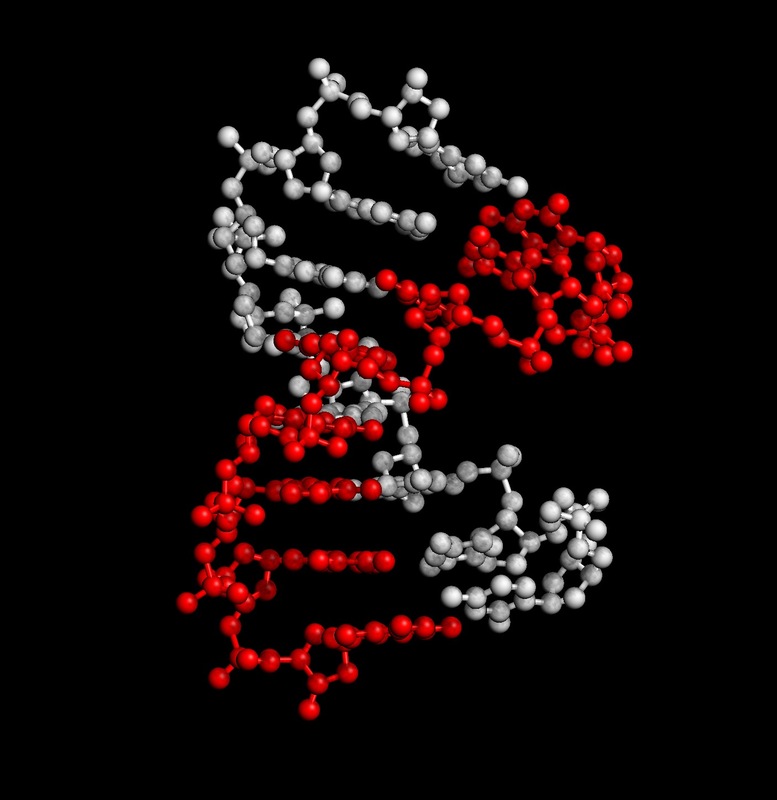 Z-DNA "on end," showing the double helix. 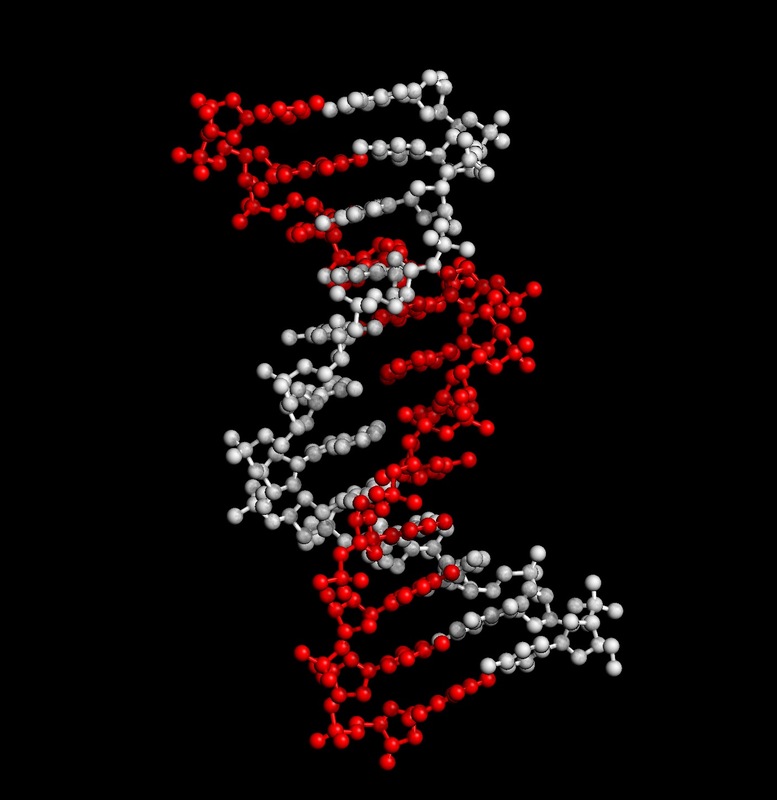 A-DNA "on end," showing the double helix. References Double Helix - Watson, J. D., & Crick, F. H. (1953). 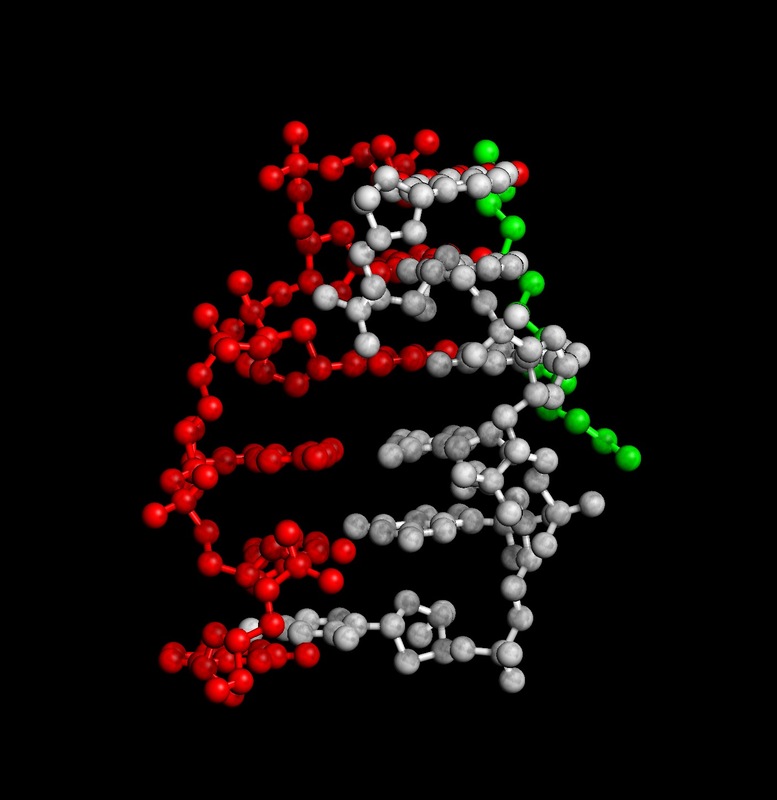 Molecular structure of nucleic acids; a structure for deoxyribose nucleic acid. Nature, 171(4356), 737-8. 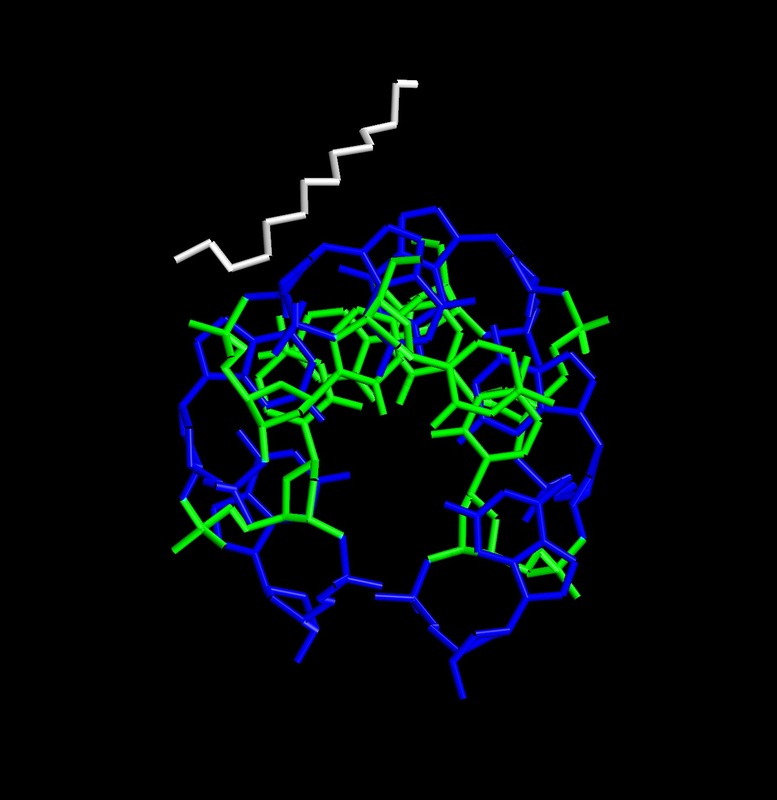 B-DNA Structure (PDB:1BNA) - Drew, H., Wing, R., Takano, T., Broka, C., Tanaka, S., Itakura, K., & Dickerson, R. (1981). Structure of a B-DNA dodecamer: conformation and dynamics. Proceedings of the National Academy of Sciences, 78 (4), 2179-2183 DOI: 10.1073/pnas.78.4.2179 First Z-DNA Crystal - Wang, A., Quigley, G., Kolpak, F., Crawford, J., van Boom, J., van der Marel, G., & Rich, A. (1979). Molecular structure of a left-handed double helical DNA fragment at atomic resolution Nature, 282 (5740), 680-686 DOI: 10.1038/282680a0 Z-DNA Structure (PDB:1D48) - Egli, M., Williams, L., Gao, Q., & Rich, A. (1991). 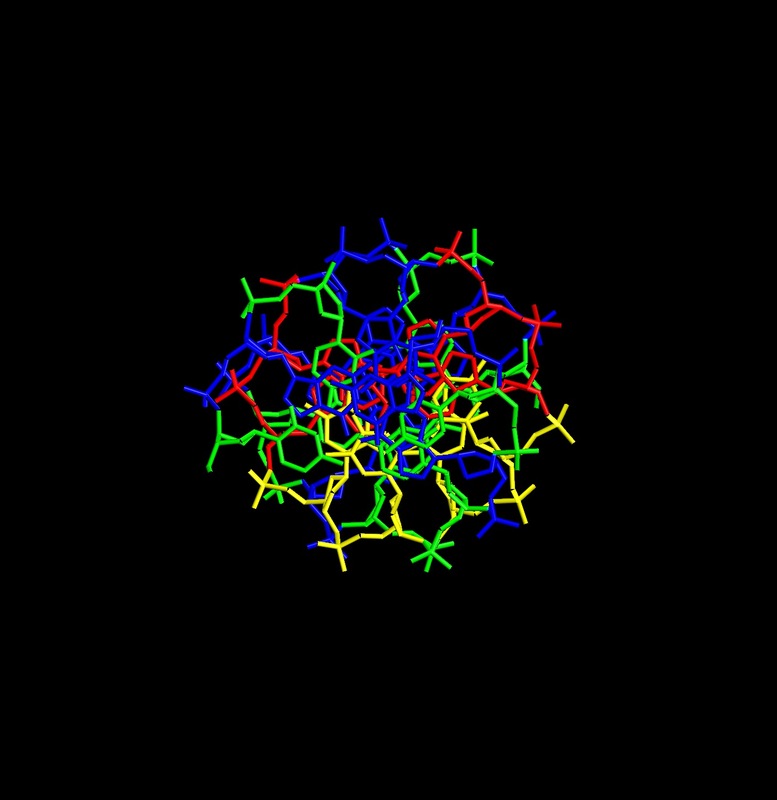 Structure of the pure-spermine form of Z-DNA (magnesium free) at 1-.ANG. 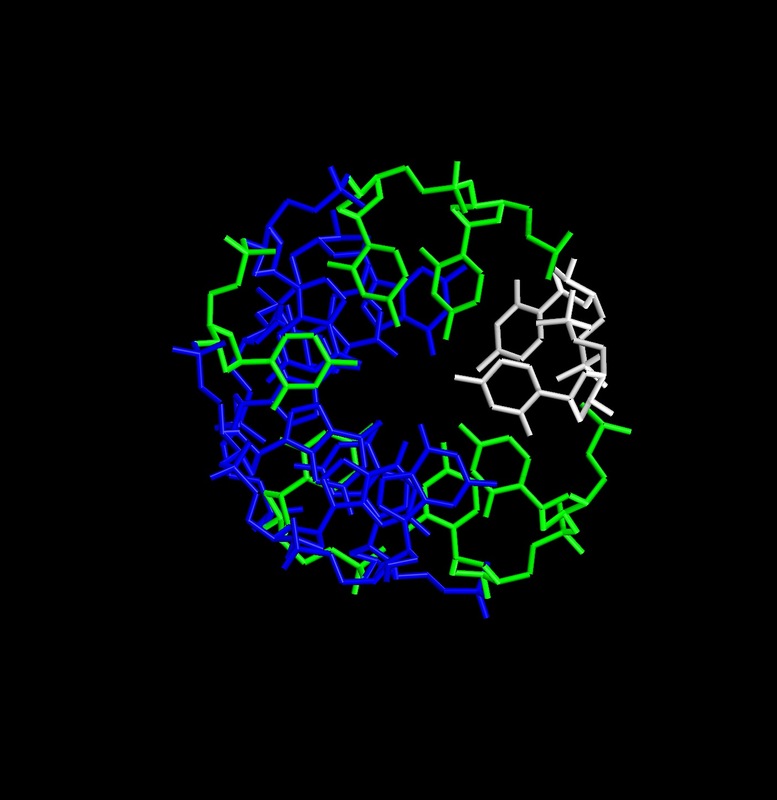 resolution Biochemistry, 30 (48), 11388-11402 DOI: 10.1021/bi00112a005 A-DNA Structure (PDB:371D) - Fernandez, L., Subirana, J., Verdaguer, N., Pyshnyi, D., Campos, L., & Malinina, L. (1997). Structural Variability of A-DNA in Crystals of the Octamer d(pCpCpCpGpCpGpGpG) Journal of Biomolecular Structure and Dynamics, 15 (1), 151-163 DOI: 10.1080/07391102.1997.10508954 Molecule World™ was developed with funding from the National Science Foundation (SBIR IIP 1315426). Any opinions, findings, conclusions, or recommendations expressed on this website are those of the authors and do not necessarily represent the official views, opinions, or policy of the National Science Foundation.